Preneur Marketing: The McFake.... Do you want real fries with that? Here is a picture of the Fake McDonald's - this is the McDonald's restuarant that is used in every commercial and movie you see. 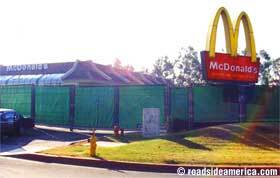 As the story goes this lonely and empty McDonalds is just waiting in the back of an industrial park near La Puente, California to be filmed. I also hear they have every single McDonald's uniform in every size from every country in the basement - and all the different furniture too. For those of you how want to visit Ronald next time you are in California, this site offers direction.